It would be reasonable to begin with some new developments — news that was broken by SJVN in his personal blog. In a nutshell, Citrix will work with Microsoft to provide system management, Citrix Essentials for Hyper-V. Microsoft’s System Center will support XenServer. That Citrix is merely serving Microsoft is hardly a surprise. What Microsoft and Citrix did with Xen is a subject we wrote about quite a lot in the past [1, 2, 3]. Ultimately, the goal is to either exclude GNU/Linux or run it merely as a virtual guest on top of Windows Server. This is very important to Microsoft. Citrix is about to put a world of hurt on its virtualization rival, VMware. Next week, Citrix will be announcing that it will no longer charge for its flagship virtualization program XenServer 5, and its new management program, Citrix Essentials, will support both Microsoft’s Hyper-V and XenServer. Lot’s of Novell in the news lately. Was it their birthmonth or something? This reminds me of Microsoft’s attack on competitors to destroy conferences etc and drive them towards the Microsoft centric. [That's just what I am reminded of.] Using Red Hat’s agreement as marketing material to help drive a stake through vmware a little quicker. I see. And as an added “bonus”, we take attention away from the Monopolysoft that is weighing down the industry. Wunderbar. Adding to all this, Jose draws a comparison that involves OSI, which is led by a Red Hat employee. Giving today’s Monopolysoft a free pass dilutes Tiemann’s great message. This reminds me of “Shared Source”. It appears to want to leave the door open for Monopolysoft to say the right things but do the wrong things yet continue to win contract after contract. There is a lot of material to digest when it comes to this latest development, but more details will have arrived by the end of next week, probably after Novell makes its major announcements as well. There are several things not to like about Red Hat’s new strategy. For example, watch the togetherness of the Red Hat and Microsoft logos. Red Hat will find it hard to complain about Microsoft even when it clearly should (Microsoft need not be treated more kindly) and the OSI’s current head is also a Red Hat employee, so there may be troubling ramifications. “Any kind of deal with Microsoft that is used as a market distinguisher is a bad deal for free software. Exclusivity is the antithesis of software freedom and even the hint of such exclusivity by approval or certification is evil,” says one of Boycott Novell’s participants. Microsoft is happy to play the “give us time to fix things and later on we’ll publish our fixes” game. Not only does this enable them to keep their software ahead of the competition and buy time to make changes to existing software, they can also patent around the changes as much as possible so that if you do discover certain secrets, they can always pull out the patent card (instead of pulling another switcheroo, since a switcheroo is not always practical or desirable). I call this a rat race. We waste time thinking we’ll reach the end. What does “full interop” mean? When Microsoft controls the entire stack, the apps can pass pieces of the puzzle and trigger signals in odd places and cause other far removed behavior to change. Much of this would arguably fall outside the purvue of something like a workgroups protocol (the EU order for full interop), but it would help thwart any third party that tries to build a drop-in replacement. O’Grady got it right as well. He realises that interoperability is just a weasel word. It might seem strange that interoperability – as unsexy a feature as there ever was – would suddenly become the apple of the marketing departments eye, not least because consumers are increasingly gravitating towards products for which a degree of interoperability is assumed; think Apple’s iPod, iPhone, Mac combination. But then consider that, as I told a few media outlets this week, heterogeneity is the rule of the day. And that interoperability is not. Such was the criticism I heard of this week’s curiously timed Microsoft / Red Hat interoperability announcement. In case you missed it, the news is essentially this: Windows Server guests are welcome on RHEL, and RHEL guests are welcome on Windows Server. Additionally, technical support will be coordinated. Sticking to open standards means that none of these “interoperability” deals should be needed. In light of the amicable deal between Red Hat and Microsoft, one might beg for an answer to the question: How does it feel for Red Hat to be bullied by former Microsoft employees and others in Acacia, as we last noted some days/weeks ago [1, 2, 3, 4, 5, 6]? On the one hand, Microsoft pretends to be friendly while on the other it shows sheer aggression. Red Hat is taking an unusual course of action in its defence against IP Innovation’s patent infringement claim. While similar lawsuits are usually carried on quietly and often settled out of court, Red Hat has called on the open source community to help find “prior art.” The validity of a patent can be disputed by proving that a patented technology was already in use before the patent was filed (this is called “prior art”). For those who missed it, earlier this month the Open Invention Network, the Software Freedom Law Center and The Linux Foundation launched the Linux Defenders Network, a group that aims to help the community defend itself against patent trolls. An article on the launch in Network World was picked up on Slashdot, causing some spirited discussion of the best way to tackle the patent problem. It was not so long ago that Microsoft’s Horacio Gutierrez was threatening Red Hat using patents [1, 2, 3, 4]. This was a well-calculated strategic decision, not an out-of-line outburst. And in fact, based on yesterday’s reports, Horacio Gutierrez has just been promoted by Microsoft. Microsoft said Thursday it had promoted its deputy general counsel of Intellectual Property and Licensing, Horacio Gutierrez, to the rank of corporate vice president. Previously, Gutierrez held the rank of vice president. [H]e also has been a proponent of controversial cross-patent licensing agreements that Microsoft has struck with companies as a way to derive revenue from its extensive patent portfolio. Returning to the subject of virtualisation, there is plenty of evidence which shows that Microsoft took over Xen’s roadmap/agenda using Citrix, which is a partner. It’s Microsoft’s Partner of the Year for 2008. Microsoft also put some of its own people in charge of VMware (it used EMC as a partner). Is it not trying to coerce Red Hat et al, being the owners of KVM? “Is it not trying to coerce Red Hat et al, being the owners of KVM?”Could Red Hat be pressured by Microsoft’s Hyper-V SLES exclusivity [1, 2, 3]? Assuming one theory is correct, could this be how/why Red Hat was reluctantly pulled to the negotiations table? It might just be a combination of factors. It’s too hard to tell because different sides will embrace different stories, spin, and self justifications that are reassuring. Novell and Microsoft too had their differences (“we agree to disagree”). Either way, the latest news was pushed into OSnews by Red Hat’s (Fedora) Rahul, who tells his/their own version of the story. The angle seems to be that Microsoft will use their marketing muscle to encourage the customer to run a Windows Server platform and allow Red Hat as a guest. In other words, Microsoft wants the primary platform to be Microsoft with anything else virtualized. I am surprised to see that Red Hat went along with this, but Red Hat may have seen an opportunity. It also makes Red Hat look a little two-faced, since their reaction to the deal between SUSE and Microsoft was anything but complimentary (as I recall, anyway). At least they did not include IP verbiage in the recent agreement (at least that they reported). This is one for the “I don’t get it” category, which is my reaction to most of these strategic partnership deals–especially ones struck between Linux companies and Microsoft. If Microsoft has a customer that is running Linux (Pick any flavor) and Hyper-V, wouldn’t they support that customer anyway? They are a customer using Hyper-V after all. The same goes for Red Hat. If someone is a Red Hat customer, would they do the same? I’m not sure that either Microsoft or Red Hat will benefit one bit from this partnership. I hope Red Hat isn’t paying any money for this “deal” and, supposedly, they aren’t. Many compare this deal to the one struck between Microsoft and Novell where there was an exchange of money and intellectual property. Industry watchers and critics, myself included, continually throw stones at that deal. Sam Varghese described the Red Hat-Microsoft agreement as “a kick in the guts for Novell,” stressing the following points. What will hit Novell really hard is the fact that Red Hat has not had to bend over as Novell itself did in 2006; there are no patent clauses in this deal at all, no question of money changing hands. Red Hat, on the other hand, has always insisted that interoperability should be based around open standards and that talk about patents is a hurdle. Red Hat’s commercial success, which has been built up after some initial errors in its business strategy, has enabled the company to wait for a deal on reasonable terms, one that could work to its advantage, not one that makes it a pariah within the community. That’s a departure from Microsoft’s deal with Novell, the Red Hat rival. The Novell agreement includes a provision in which the companies agreed not to sue each other’s customers for patent violations. Many people in the open-source community see that as Novell implicitly endorsing Microsoft’s contention that Linux and other open-source programs violate the Redmond company’s patents. Novell disputes that viewpoint, but the deal is generally unpopular in the open-source world nonetheless. 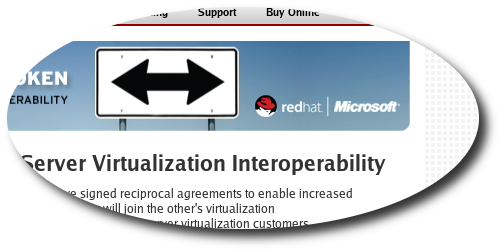 Microsoft has made an agreement with Red Hat to collaborate on virtualization interoperability. Unlike the controversial deal between Microsoft and Novell, this one contains no patent pact. No doubt Red Hat wanted to be sure to clarify that its deal with Microsoft is not the same as the one Microsoft struck with Linux distributor Novell two years ago, which did include exchange of IP and cash. At the time Red Hat executives said they were not interested in striking such a deal. In addition to ensuring interoperability between Novell SUSE Linux and Windows, the Novell deal also indemnified users of Novell’s Linux against any claims of patent infringement for any Microsoft patents SUSE Linux might include. In response, Red Hat said its customers are protected by any patent claims by its Open Source Assurance Program, and many Linux proponents called Microsoft’s claims an attempt to spread fear, uncertainty and doubt (FUD) among customers who purchase open-source software in order to promote its own proprietary software. O’Grady suggested it was probably Red Hat that lobbied hard against including IP-sharing in the deal to maintain its stance against the Novell deal and Microsoft’s patent-infringement claims. 451 Group analyst Jay Lyman explains that it’s about cooperation for customers, but this may miss the point that customers can be manipulated so as to pressure vendors to go into deals which they otherwise would never have considered. To borrow a political analogy, people can be suppressed and ‘punished’ (e.g. economic strangulation) by foreign countries as means of getting the government blamed and thus having it overthrown by a coup. In the 1980s, the United States did a lot of this in central and south America in order to made leaders more obedient. Jay Lyman, an open source analyst at New York City-based 451 Group, said the agreement was “a little light on the details,” but appeared to be a win for customers, with greater flexibility and interoperability. This may sound like a form of imperialism by coercion, but maybe this hypothesis is too much of a stretch. Here is a different perspective, which is focused on VMWare despite the fact that VMware is now almost an ally of Microsoft (Tucci overthrew Greene quite viciously). A LANDMARK technical support agreement announced overnight between Red Hat and Microsoft is squarely aimed at destabilising virtualisation leader VMware. Here is an article about a new virtualisation tool. The writer seems to be favouring the Novell-Microsoft pair for no apparent reason. InstallFree Bridge Suite 1.8 makes a stronger argument for application virtualization than do products from more well-known vendors such as Microsoft and Novell. InstallFree’s tool offers simple management capabilities and doesn’t require components to be installed on the server or end-user systems. Still, InstallFree Bridge Suite 1.8 shares the shortcomings of other app virtualization tools. The clash between those two kinds of programs is nothing new in the computer industry. Microsoft has made claims that Linux violates a number of its patents. Red Hat, for its part, says software patents “generally impede innovation in software development,” though the company does hold some patents. Monday’s news was the clincher on the server side; Red Hat and Microsoft agreed to validate each other’s operating system on their respective virtualization hypervisor technology. Once validated by both parties, customers with valid support agreements will receive cooperative technical support. What was really impressive is that Red Hat pulled this off without patent or financial clauses. I believe this deal was inked, simply put, because customers demanded it. It also shows Red Hat has some serious pull, not surprising given their beat-the-street quarter and posture to gain some new ground as a result of poor economic times. All the others ganging up on VMware is a bit like all the other distros forming United Linux to take on Red Hat. We’ve been working on a virtualisation project at work – turning a rack of sixty assorted x86 boxes running a mix of RHEL, Solaris and Windows into sixty VMs on a couple of blade boxes. VMware was the clear winner. Xen is pleasant enough but not nearly as mature, VirtualBox is ludicrously shoddy rubbish (and Sun is going to have to kick some a*se at Innotek to make it less so). Hyper-V HAHAHAHAHA. VMware has one important advantage: their stuff works much, much better than the competitors’ and isn’t onerously expensive. It’s eight years old and it really shows. It’s a good thing you have followed M$’s Slog against VMware. That background is important for understanding M$’s motivation and the implications of the deal. Marketing is M$’s most important weapon and it all seems focused on proping up software patents as US courts demolish them. It was a lie then and it is a lie now. From my own experience, VMWare(esx) is far more mature than the other competitors, certainly so with the management tools. Virtual Infrastructure is so much more pleasant to use than command line with vanilla Xen. I’ve never used Xensource so I’m not sure what offerings they have on the tool front.